Writing the first draft of a novel involves a lot of idea generation and writing the bare bones of the story, as well as putting the overall structure in place. Sometimes you may come up with a topic or a place or theme you don't know much about before you write it. I have found mind mapping to be very helpful for this research prior to writing the scene. Here is a rough mindmap of my research on storms in Arizona. I used the principles in this article on writing about a new place. Although I have been there, it was a long time ago and I have no notes on it. I searched for pictures of storms in Arizona and found some great images. I looked through the images and wrote down my thoughts and impressions, what the lightning reminded me of, what was in the background of the pictures. This led to an investigation into types of lightning and what each was called, as well as what causes the thunderous noise. To ground the storm in a physical place, I searched on the plants and trees of the area the storm would be in, and found pictures and descriptions of saguero cactus, jojoba and other desert plants. I listened to sounds of various storms (free sounds here) and wrote down my thoughts, in an attempt to avoid cliche descriptions of rolling thunder. I used a Thesaurus to try to uncliche the descriptions I came up with. 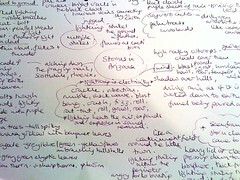 I then wrote around 1000 words of a scene with the storm in the background of the action. It took me a couple of hours of research to actually get this material but I think it was improved by my attempt to ground it in reality as well as get into the storm frame of mind before actually writing. Mindmaps enable you to brainstorm thoughts and connections before you write in a linear manner. This helps you to come up with new ideas and phrasing and acts as a guide for your writing when it is time to actually get the word count down. Do you find mind maps helpful in your writing? I have tried it before, but not for a long while… it’s quite effective though. I start writing letters when I am stuck on something, but since I had forgotten about mapping until reading your post, will remember it next time. hi! this is great! i love the way you described how you research Arizona, lightning, the plants, the desert – isn’t the internet WONDERFUL!! how did writers ever write without it? anyway, i really like the mind-mapping idea and also, in a previous post of yours, how you talked about the necessity of the ‘fallow field’. I lately finished my second novel (it’s at four publishers now being reviewed) and am in a strange sort of limbo-land with absolutely no solid ideas whatsoever about what I’m going to write next – but I am encouraged by the fallow field metaphor and will try to let that calm me down until the next idea starts to emerge – and then I’ll use the mind-mapping drawing to help flesh it out. Thanks so much! I’ve used mindmaps and other kinds of mapping tools extensively in my work, and I’ve played with them more recently in the context of research for a novel. See a small map focused on French Film Music Composers on my blog. Just a quick look at the map brings up much more detailed memories than a full page of text could possibly elicit. I’ve tried using Mindmapping, but I haven’t been that successful. I’m still using it, and I’ll keep using it, but I’m not sure how I’m suppose to do it better in order to organize my thoughts for the novel I’m writing. Hi Jens, I just use a pad and paper – not software. Maybe you could try that and just let it all flow – I have coloured pens as well! Yes, that’s a good idea. What’s the size of your notepad? This is a great post! After thinking about it, I suppose I’ve done “mind mapping” for my current novel, though it was more linear than lateral. This is because I wasn’t struggling so much with idea development as timelines that all fit together logically and rationally. I’m writing a historical drama in which my fictional characters and their lives intertwine with actual historical events, and there are a few parts where the two meld — kind of starting with reality, then making up stuff to advance the plotline. I’ve read novels like this and I love it when I can barely tell the difference between what actually happened and what might have but who knows? This linear map I made was actually a spontaneous thing. I wrote in v-e-r-y small letters with a purple pen on a long, narrow strip of left-over drawing paper that I couldn’t bring myself to throw away because it costs $8 a sheet. So the timeline runs in two layers on both sides of the sheet. And here’s something I learned that may be helpful to other writers: purple ink is NOT permanent. Though the pigments are beautiful, they are fugitive, even when not exposed to light. Trust me on this. Thank God I looked at them when I did, because over a few years, they’d already faded so badly that I had to go over them again so I wouldn’t lose all that info…this time in black ink! Thanks for the thought-provoking piece! I’m going to send people over here from my blog, First Draft, at http://maryshafer.thewordforge.com/blog/. A real “ah-ha!” moment for me. I use mind-mapping all the time in my corporate life for R&D of new products, workflows, service models, and the such. In a not-so-well-thought-out dogma I thought to keep my work and hobby separate and kept mind-mapping out of my creative process. I see now that I’ve left a productive tool unused. Thanks! I use MindNode to mind map on my computer – it is amazing! I used it to map out my novel in progress. Its easier for me because when I use pen and paper I tend to scribble and cross things out a lot. Its a mac app, I’m not sure where I found it originally but I’m sure you could find it if you Google it. It’s also great for a lot of non-writing uses – I used it to map out my family tree for my dad when he found a website online that traced our family history back several hundred years. I’m a HUGE mind map fanatic and use them all the time. I find it helps to write on a whiteboard with some colorful dry erase markers, snap a photo of it with my smartphone, and upload it to my computer or a place like Evernote for future reference. This is especially great if you use a large whiteboard so you can have more space to write as well as have a bigger picture for your viewers. As far as software goes, I like Xmind (http://www.xmind.net). It’s free for the basic version, which is all I ever use.